I said on Tuesday that I’d be back swatching this week, and it may be Friday today, but here’s a promised nail polish swatch! 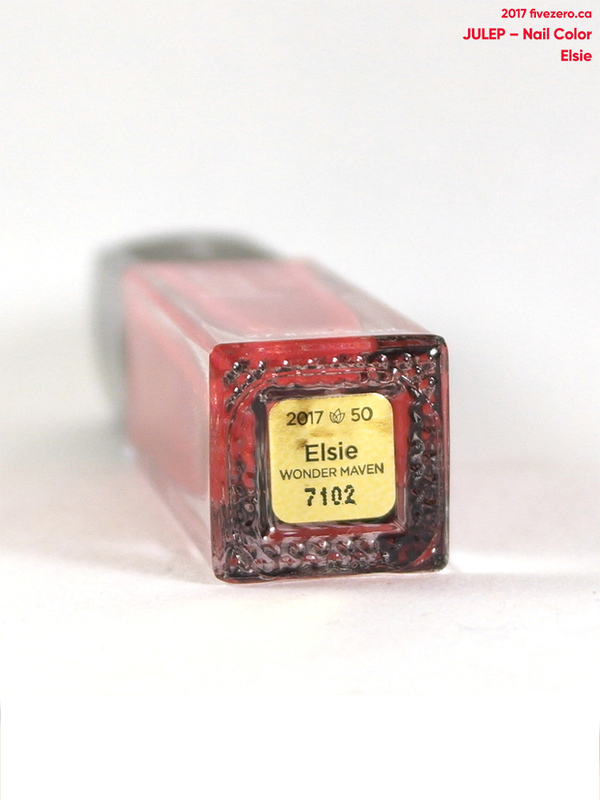 Elsie is one of the polishes I received in my first ever Julep Maven box, back in June. It’s a great way to kick off my Julep subscription, because I am so in love with it! 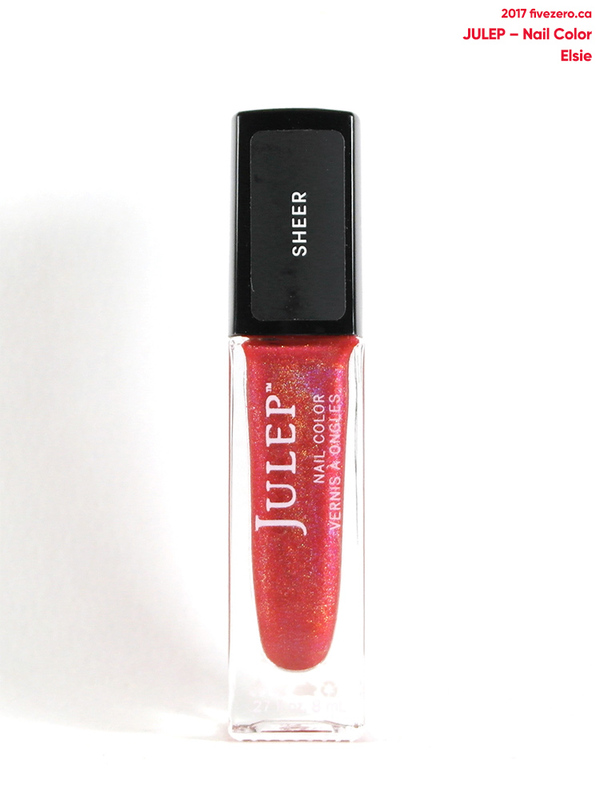 Described by Julep as a “Strawberry Popsicle Holographic Jelly,” the color description is spot on. It is also labeled as a sheer, though I’d really call it a semi-opaque. And don’t let the “jelly” descriptor fool you: it’s not a proper jelly, and doesn’t have that thick, cushy feel. It actually applies quite thinly, though it is still well-pigmented and is nearly opaque with two, easily applied coats. Julep’s brush is very nice: a little wide, a little paddle-shaped, and really well-sized for my smaller nails. The square black cap actually removes to reveal a small, ridged cap underneath, but I was new to Julep and did not realize this was the case when I was swatching. The entire cap just unscrewed so the square cap is what I used to paint my nails. Later, I saw photos online showing the cap removed, and learned that I had to pull pretty hard to get that black top off! I actually don’t think I’ll ever use it like that; it’s too annoying to have to yank the tight top off, and I didn’t mind applying with the longer, fatter square cap. But I’ll take a photo for my next Julep swatch. Elsie is such a pretty strawberry holographic! The color is just lovely and I think it would complement a wide variety of skintones, as it isn’t too warm or too cool a pink. The holographic shimmer is very fine, and not densely packed, giving off a more subtle, but still very pretty, effect. It could dry a bit shinier, but a shiny top coat fixes that easily. I would think that the semi-opaque nature of this shade means it would also be a nice, subtle holo topper over another polish. This polish had pretty good longevity for me, as well. I used two coats with no base or top (lazy!) and it lasted about three days without any serious wear—and I am not easy on my hands. I really dig this polish and am looking to swatching more Juleps on this blog! Let me tell you…I’ve splurged on an awful lot of Julep this summer! Ahhh it’s my new addiction! It’s really cute! 🙂 Very happy with my first batch of Juleps. Why don’t I have more strawberry polishes, really?! Yes, I remember you mentioned that! Really some of the Julep shimmers/metallics are so gorgeous.